﻿A holistic approach to Massage Therapy means that not only are symptoms considered, but more importantly the impact upon the whole person (mind, body, spirit) is taken into account. Wellness, Happiness, Energy, Self Esteem, etc. are linked to our body and our mind and to be in a state of wholeness, good health and balance it is vital that both are considered with any therapy. Massage Therapy, Reflexology, Reiki, Spinal Touch and Ayurvedic Sessions all encourage the body and the mind to relax. ​It is when we are in a relaxed state that the body's innate self-healing ability kicks in. 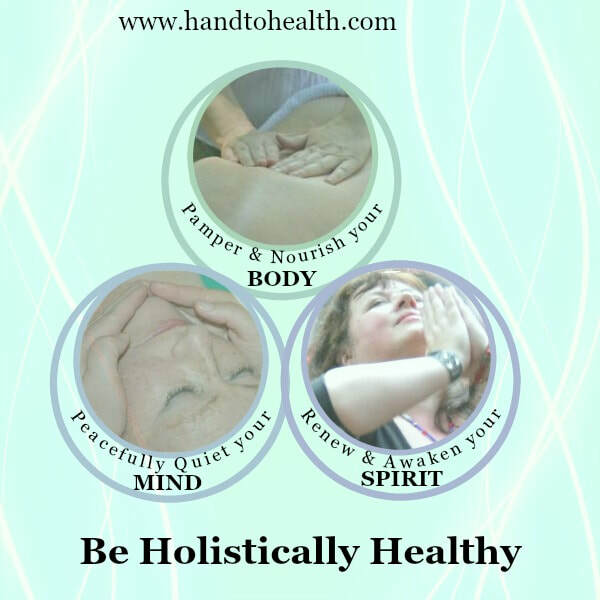 Holistic Health therapies act as a catalyst to wellness. When the mind is calm the body will follow. Harmony is unavoidable. Slow Down. Stop. Just Breathe. The body speaks to us through pain, tightness, illness and symptoms. Our body constantly sends us messages that are asking us to take care. Massage Therapy, Reflexology and Spinal Touch are natural ways to relax muscles, ease pain and increase energy. Spirit is able to connect and communicate with us mindfully, when we are relaxed, open and calm. When we nurture that connection to life we thrive in a place of harmony, balance and wellbeing! Reiki and Ayurvedic sessions assist us in this body and soul experience.